A temporary rail yard will be set up on the eastern side of the Metropolitan Transportation Authority’s tracks — where buses are currently stored — to allow Forest City Ratner to build the arena on the western portion of the yards, according to a source familiar with the project. The developer expects “to begin working on the arena in the fall of this year,” said the source. Despite the MTA’s agreement to sell the yards to Forest City Ratner, no lease has yet been signed. The Daily News also reports that demolition of a former auto repair shop at 179 Flatbush is slated to begin this week. Develop Don't Destroy's Daniel Goldstein, who is one of the plaintiffs in the emiment domain suit calls the work "premature and a scare tactic for the community fighting it." 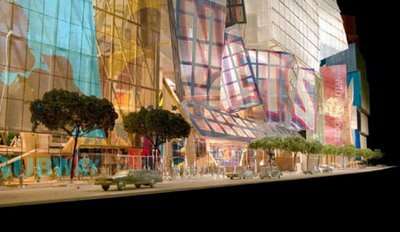 Mr. Goldstein's apartment sits on a piece of land without which construction of the Nets Arena can not go forward, and there are other parcels which the developer does not own.